With strong connections to the natural world, the colour green is thought to be connected psychologically to the attributes of balance, harmony, and growth. A combination of yellow and blue, green contains some of the optimism and energy of yellow, balanced with the tranquility and insight of blue. Within a home, the colour green has the ability to cultivate a harmonious and lively atmosphere filled with a sense of abundance, as the colour has strong ties to imagery of lush, healthy leaves, soft grass, and vibrant natural life. Have a look at these 8 rooms that showcase their love for this lively, confident colour in unique ways – find inspiration for ways to add a little green to your own home decor! Nature reigns in this down-to-Earth bedroom design. An open layout lets the room breathe, with a small platform distinguishing the area of the room intended for rest. Along with natural materials like the wicker chair, wooden table, and woven rug, a eco-centric green motif winds its way about the room. 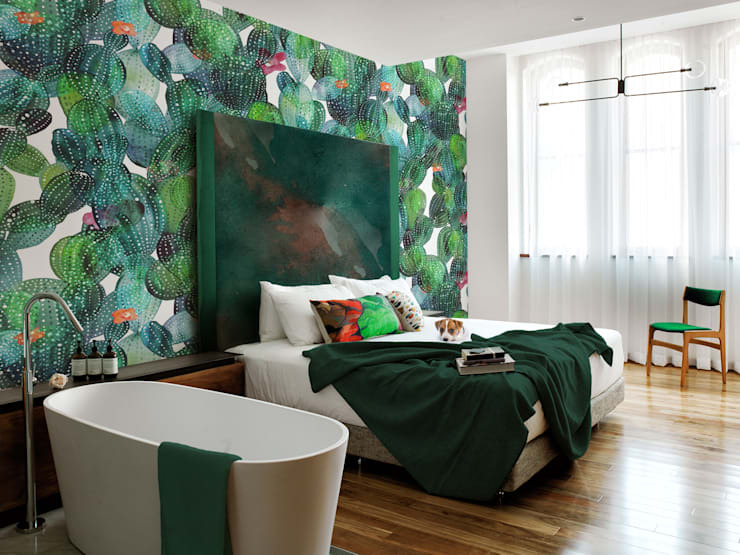 Statement walls make a big impact here, with some walls in solid green, others sporting a leafy green print, and another appearing as a giant, multi-hued watercolour. 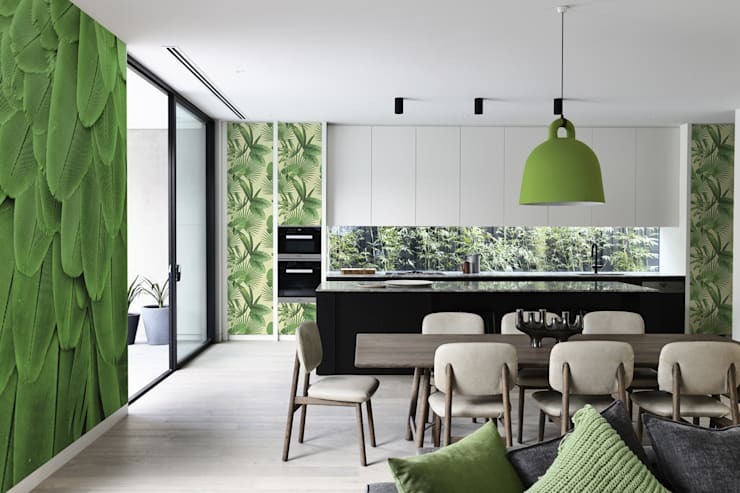 An unusually green kitchen takes a walk on the wild side with an eclectic mixture of leafy patterns. The theme here is clearly “green”, but everything else is up to interpretation: from the crocheted yarn pillowcase to the enlarged high-definition leaf photo that covers an entire wall to the wild strip of trees that act as a kitchen backsplash, this space is made to celebrate nature’s variety! The word “desert” doesn’t often bring up notions of greenery, but this room is here to demonstrate the beauty and bounty of life in the desert. 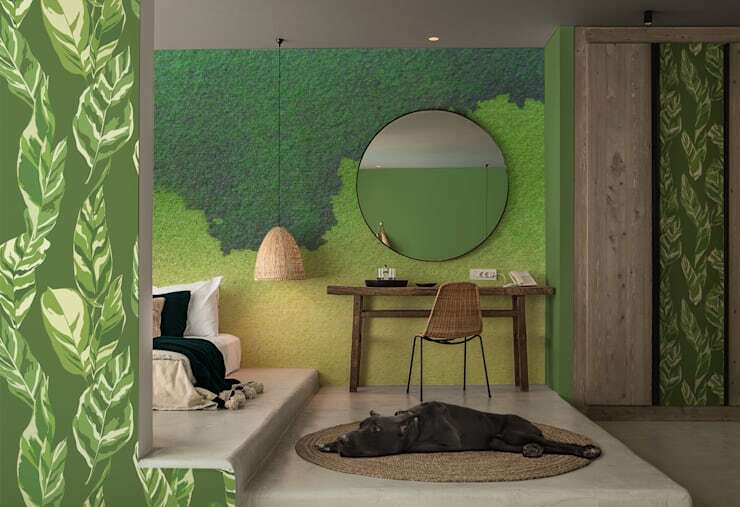 A playful prickly pear print acts as the protagonist of the space, with a large green headboard tying together a variety of colours from the wall’s motif. Around the room, an assortment of green details (with a pop of red here and there for contrast) work to carry the theme throughout the space. 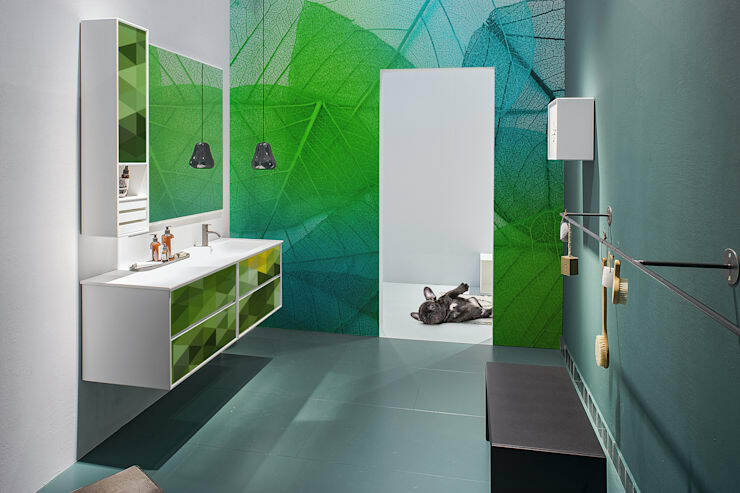 This creative bathroom is fresh, vibrant, and energetic – everything you’d want to feel after a hot morning shower. The space supplies a stage with clean lines, simple surfaces, and minimal furniture, allowing the punchy geometric patterns and large, leafy art to shine in their upbeat eclecticism. A contrast to the rooms above, this kitchen takes a more subtle approach to being green. A light, mossy colour has been chosen for the cabinetry, well balanced among the soft beige in the wooden floor and curved countertop edges. In this design, green displays a more nurturing character, exercising a calm, harmonious effect over the room. 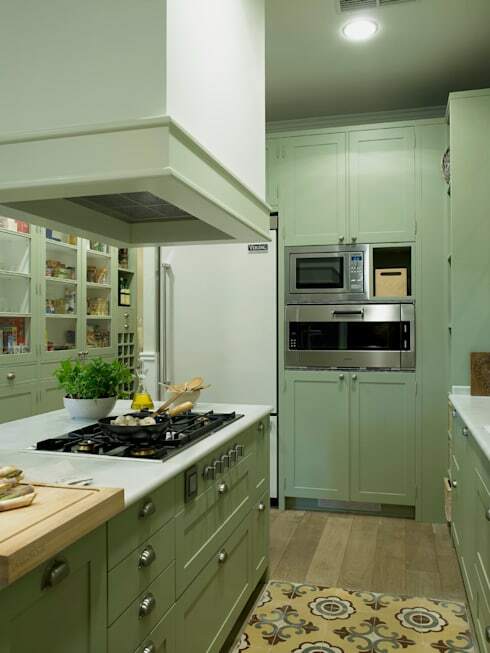 This hip modern kitchen delights the eyes with spontaneous pops of green in shades that radiate energy and optimism. 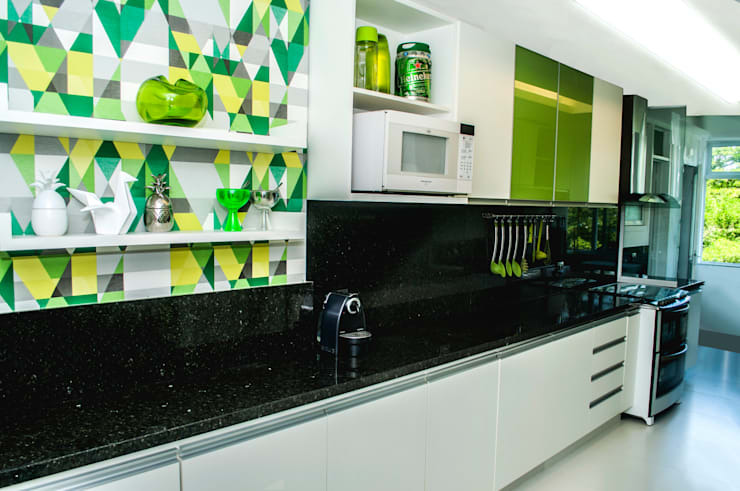 Cheerful and upbeat, this colour theme is simple enough to replicate, as the features that these interior architects have used to create this green theme – utensils, wall sticker, cabinet door – are fairly inexpensive and easy to install. 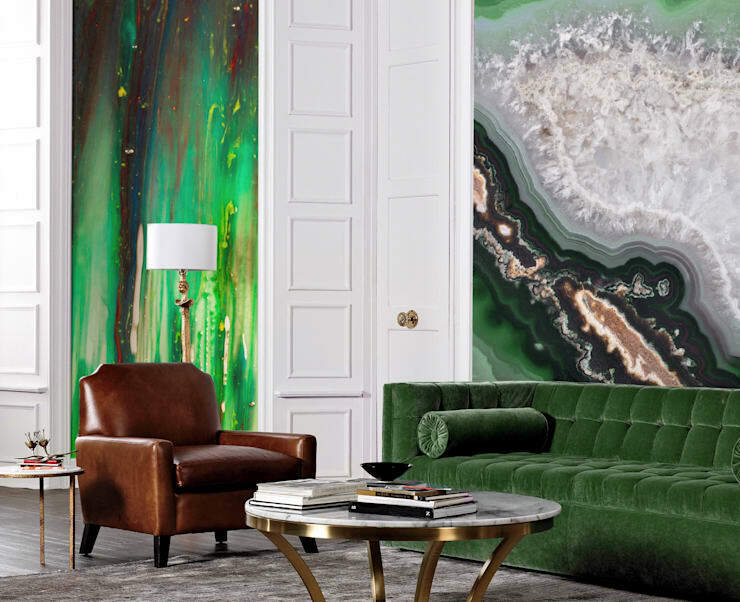 This living room celebrates green as it appears in the mineral world with a wall-sized enlargement of agate. Nearby, a splatter paint wall full of browns, golds, and reds provides a backdrop for brass furnishings, brown leather, and a mossy green corduroy, composing a living room scene that’s as earthy and gritty as it is quirky and artistic. When you can’t decide between your options, just choose all of them! 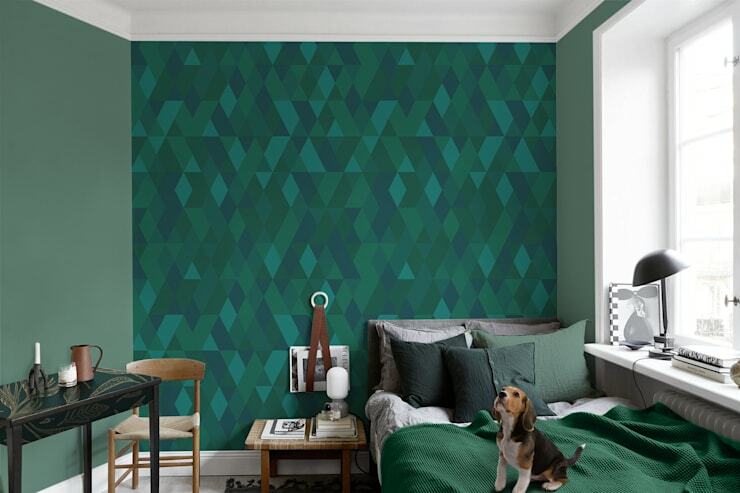 This bedroom combines many hues and shades of green, from a solid greyish green in matte to a geometric composition of turquoise, forest green, and even dark blue. This room is an excellent display of the beauty found in mixing rather than matching. Feeling the green? Share your comments on these green home decor ideas below!